A reader asked me this question a few days ago, and I think my answer would have to be one word… “inertia.” The prospect of a lifestyle change is so overwhelming for most people, they are understandably afraid to take that first step. I hear from so many people who really want to live more simply, BUT… and I mean this seriously… they’re making “simple living” too complicated. Although the eventual goal may be a major lifestyle change, a more gradual approach to simplifying will work best for most people because it can be done in small, non-intimidating steps. A good way to begin is to simplify the life you’re living right now… for example, these three very basic simplifying ideas will work for anyone, regardless of lifestyle. Start with what you and your family eat, with the goal of eating more healthy, natural foods… but again, this is a change you don’t have to make all at once. If you eat out frequently or depend on convenience foods for most of your meals, start with a goal of one “from scratch” meal per week and more “one-ingredient” foods. Start keeping a record of what you spend and where. This will help you better understand why you spend and will make it easier to eliminate unnecessary purchases. Start saving where and what you can… even seemingly insignificant amounts saved consistently add up over time. Start doing more things yourself instead of paying someone else to do them. Tackle easy projects you know you can do at first, then move on to more challenging ones as your skill level (and confidence) increases. You will save money by doing these things yourself, but the immeasurable personal satisfaction you will gain is even more important. 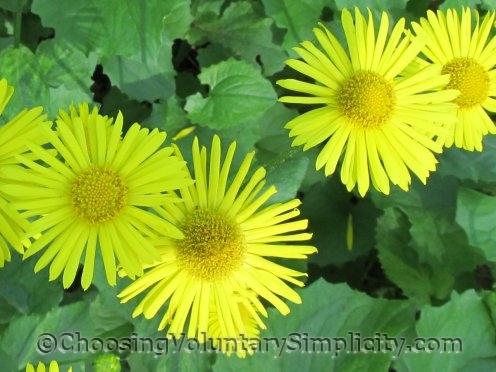 Remember… there is no set formula or “one right path” to a simplicity that is right for everyone. Work toward YOUR version of simple living… a lifestyle based on your personality and your circumstances. This is the simplicity that will be the most fulfilling to you. Small steps and gradual changes make more sense than the all or nothing attitude I read elsewhere. I appreciate your wisdom and your insight. Thank you. This post has inspired me to try all 3 of the first steps you listed. We’re a family that eats mostly preprepared food so this is going to be a change. We can do one meal a week. I know we can. The other 2 steps will be easier but you have given me the incentive to actually do something instead of just want to do something. To much unneeded stuff causes unnecessary chaos and clutter. My theory is why keep it? Just use it or lose it. When I say lose it I mean give it away. Another person’s trash can often be another person’s treasure. I seldom buy frozen, or boxed processed food, it’s more expensive and not very healthy. I recycle all cans, plastic, and glass. I recycle old clothing by creating usable goods like shopping bags and pot holders etc. For me it’s baby steps. Shirley, I think you’ve hit the nail on the head — ‘making simple living too complicated’. It’s all about making subtle changes that add richness to your life, not about turning your life upside down and depriving yourself of everything you’re used to. Great post! This post really hits home for my husband and I. We know what we want to do (simplify) but we have been afraid to change anything. Somehow thinking about being able to change just one thing at first makes a huge difference in how any change feels, if that makes any sense. Thank you Shirley for your sensible, gentle approach to this topic. Does anybody else find that this is true for them as well? Other than that, once my husband graduates from college, starts a new job, and we get settled in our new location, we will continue to implement, step by step, the changes we want to make to get us further down the road to self sufficient living. 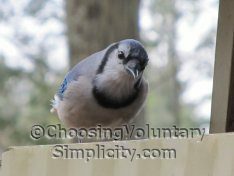 I first came across the original article on Voluntary Simplicity about 35 years ago, and have tried to implement many aspects of the concept ever since. I find it to be one of the most sound analyses of quality of life I have ever read. Of course the key word is “voluntary.” And implied in “voluntary” is “capable.” Without skills and abilities a person may want to simplify and save lots of money, but is unable because of lack of knowledge and skills. Well these skills of self-sufficiency are all acquired by those who have them, and can be learned. Anyone can learn to cook and prepare meals, do basic auto maintenance, bake no-knead bread and other kinds of baking, do plumbing and electrical repairs, take charge of one’s own health behavior, take on carpentry and remodeling projects, plant a garden and do one’s own landscaping, paint one’s own house, and many other skills making greater “voluntary simplicity” a real possibility. Community colleges are a great source, there are many good books out there, and there are certainly accomplished people in everyone’s network who would be glad to share their expertise. I look at these kinds of knowledge and abilities as a virtual “line of credit” that doesn’t have to be repaid. I am presently remodeling my bathroom, will save at least $10,000, and am enjoying the challenge and satisfaction that comes with the process. What better way to spend the time acquired by “downshifting” than learning to be a more capable person! I love your website and wanted to offer an alternate view of #3. I have a long commute, which isn’t going away any time soon. I’m also back in school, my choice, and having a blast with that. I started cooking more for myself a while back and really enjoy it. I do my own taxes and finances and my own cleaning. But there are some things I’ll never do unless I just don’t have the money to pay someone else to do them: namely, maintain my lawn and maintain my car. On the car, I just don’t have the skills or desire–and prefer to leave that to the “professionals.” On the lawn, I did it the first year I owned a house, but it took too much of my leisure time (and this was well before the commute) and when I had to start taking vacation time, I decided to turn it over to someone who wants to be out there doing it. My long-term solution on that might be to someday move to a condo or to do some landscaping that eliminates yard work, because I don’t like doing it and probably won’t even if it’s a little. I agree that we should all find our own version of how to make voluntary simplicity work, and this has been my way. thank you! I have been working on simplifying, eating healthier – purging etc for 6 years or so now. Sustaining my goals on a day to day basis can sometimes be difficult – reading articles such as this one give me a much needed boost. Love all the answers here. One of the biggest hurdles for me was to get over the feeling that I wasn’t contributing to society because I don’t have a 8-5 job in the work a-day world. I use to for 20 plus years (don’t add too many pluses, I’m not THAT old :)) This way of life totally goes against the norm and I ask myself why? It is healthier and I get more accomplished. I found that trying to convince someone (anyone) about the freedom one feels when they let so much of what so many hold important, well it is quite liberating:) Whatever degree one embraces this simplicity, the rewards far out weigh the decision to go ahead and live (I believe) the best life one could have. Such good advice. I have been thinking about this a lot lately. If I had to pick one word it would be”spouse”.